Justice League #23.1, I mean Darkseid #1, was released a couple of weeks ago. 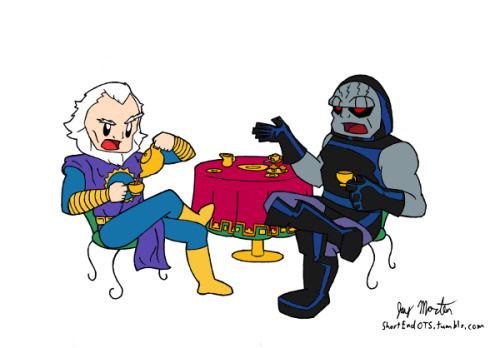 Don't get me started about how much majesty Jack Kirby brought to Darkseid and Highfather when he wrote and drew those characters. Instead let's just talk about proofreading. Highfather's given name appears three times in this New 52 issue. The first time it appears as Izaya, just as Mr. Kirby always wrote it, but the other two times it appears as Ixaya. Huh? So which is it? I ordered Drunk Stone Brilliant Dead without knowing more about it than that the book presented a history of the creators responsible for National Lampoon magazine a few decades back. I try to quench my scholarly thirst for knowledge regarding pop culture topics about which I know little; I was not thinking at all about comic books when I placed the order. I had expected the tome to be a standard-sized volume featuring text only, so imagine my surprise when the mailman delivered a fairly massive coffee table book that consists of roughly 20% comics material reprinted from the magazine! The beautiful sample above is by Russ Heath from a mid-1970s issue, and other comics artists represented in DSBD include Frank Thorne and Frank Springer. There is exactly one panel in the book from a semi-regular strip that was drawn by Neal Adams. Many National Lampoon subscriptions were canceled because of the strip's blasphemousness, says the book; a statement like that is enough to pique anyone's curiosity, so I looked it up. Over here you can read this strip as well as read about it. Below is one image to give you a taste. Breaking Bad has turned into quite the powerhouse on the small screen. But do you know that it's been spilling over into the comics world just a little bit? The above excellent caricature is by J. Scott Campbell and you can see the gentleman's take on the show's other main characters over here. Even more to the point, the Breaking Bad writing staff and artist Steve Ellis have collaborated on an online comic book that summarizes the series. You can read about this comic over here and you can read the comic itself over here. A few decades back I purchased a couple of collectible superhero coins, and now you can have a go at it if you like. The Royal Canadian Mint is releasing seven different Superman coins in extremely limited editions; some of the coins contain gold and the rest contain silver. The Superman images on the coins are from the chronological extremes of Joe Shuster's Golden Age drawings and Jim Lee's Modern Age artwork (so fans of Curt Swan or Wayne Boring or Neal Adams may choose to sit this one out). Full details are available over here. The article indicates that one of the seven coins is 80% sold out in advance of its striking, so you should probably get right down to business if you are so inclined. 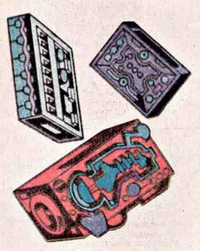 I've written previously about Jack Kirby's wonderfully named Fourth World creation, the Mother Box. Today I'll tell you about @Mother_Box. The other day, instants after I tweeted that I had written about Big Barda, a reply tweet arrived from @Mother_Box simply stating "ping.ping.ping." Keep in mind that the Kirby creation of the Mother Box was basically a hand-held computer that took care of its owner's every need and that ping.ping.ping was its sound effect in the comics. It seems that the proprietor of @Mother_Box has written a program that scans all tweets for Fourth-World-related keywords (like Barda or Darkseid) and then automatically sends out the calming ping.ping.ping reply to those tweets. The DC comic entitled Ame-Comi Girls is a strange beast. The stories are set in an out-of-continuity universe where almost every character is female (with the exception, it seems, of a few villains). You can tell from the cover above that The Flash and Adam Strange and Steel are each re-imagined as being female in this series. The stories are fun and, considering I survived reading Bob Haney's stories of the Super-Sons in 1970s issues of World's Finest Comics, this offbeat Ame-Comi universe also will not be the thing to do me in (although I'm still unsure what "Ame-Comi" stands for exactly). I bring it up because the latest issue (#7) presents an off-kilter new take on some beloved Jack Kirby characters. I showed you back here my recent acquisition of a 1972 Mister Miracle page of artwork featuring Big Barda and the Female Furies, and this Ame-Comi presents Big Barda and the Pirate Furies. Why not? The sticker's proclamation seems like an appropriate sentiment with which to re-ignite The Flame of the Hayfamzone (which had been unintentionally flickering for the last ten days). Welcome back to the hayfamzone, I say to you and I say to myself! 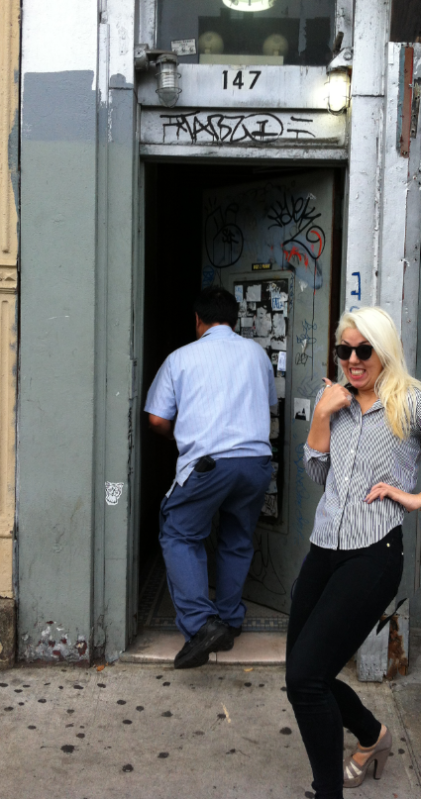 Jeanette Day in the Hayfamzone! That's her Kirbying in the above photo, which I told you all about back here. And I showed you Jeanette's appearance in a major motion picture back here (before I had revealed her true name to you). Certainly you remember the comic-related animations she programmed for us. But I think I never told you that Jeanette is an artist. My bad! The whole world knows now, though. The Style section of the September 5, 2013 edition of the New York Times featured a quarter-page profile and full color photo of Jeanette! You can see the online version of the Times article over here. 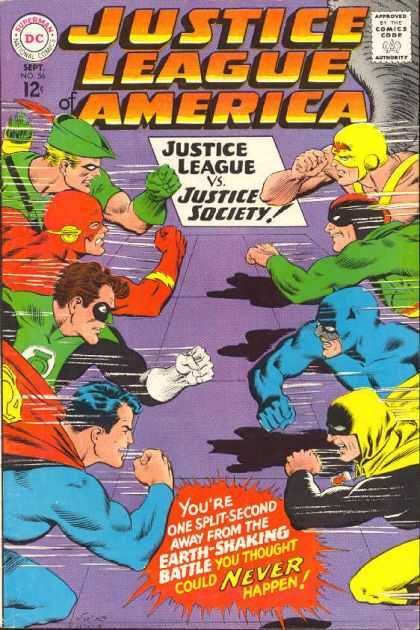 The cosplay face-off composition reminds me of the Super-Team Versus Super-Team cover format pioneered by Carmine Infantino and as first seen on 1967's Justice League of America #56 (shown below). Just look at those forceful Infantino pencils and those supple Murphy Anderson inks and that timeless Ira Schnapp lettering. Nice! 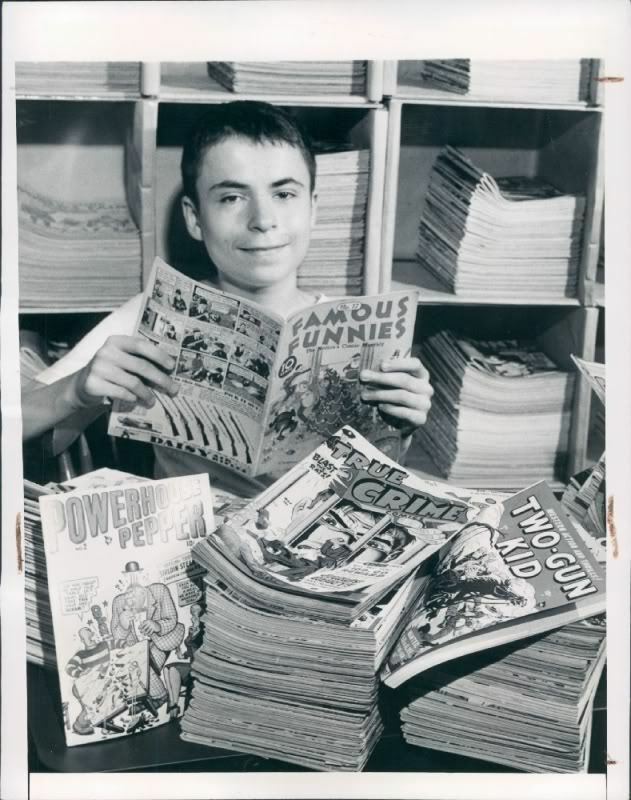 Hey, who unearthed this 1948 photo of me and my comics?